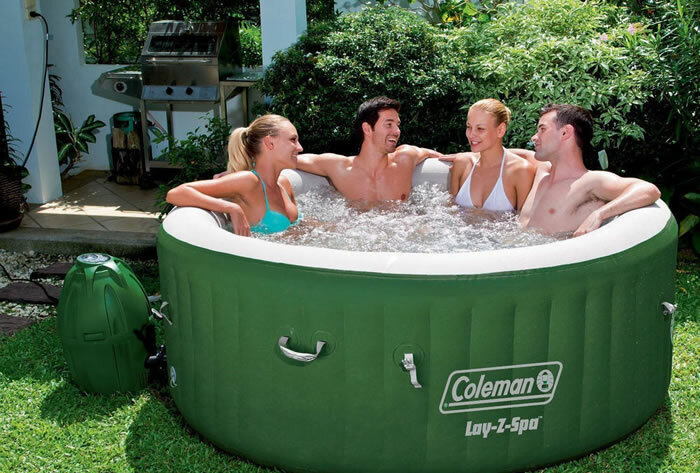 Inflatable Hot Tubs - the Best 2, 4, 6 and 8 Person Inflatable Hot Tubs! Here we take a look at the best small, medium and large sized hot tubs. Two person hot tubs are relatively cheap and due to their small size tend to be much easier to install & maintain. 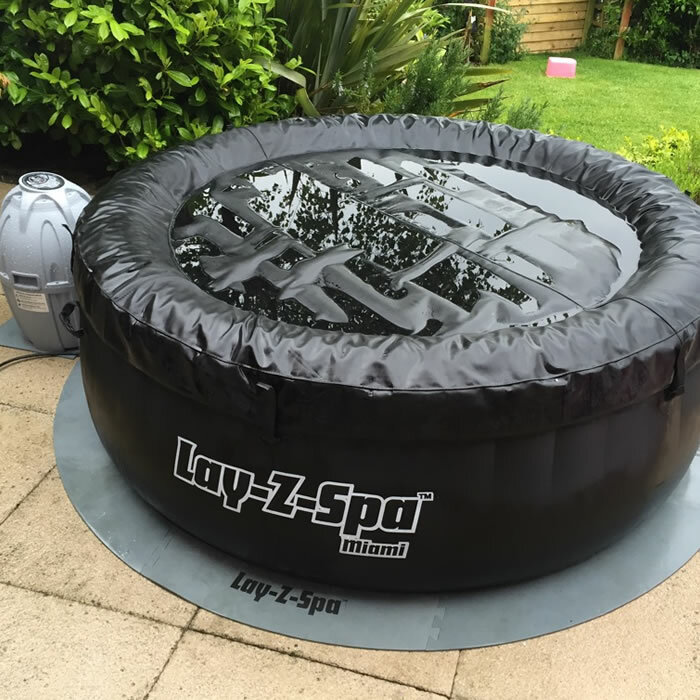 Check out our review of the best small inflatable hot tubs. As the most popular type of hot tub, you have the largest selection of products to choose from. Here we take a look at what we believe to be the best medium-sized hot tubs for 2016. 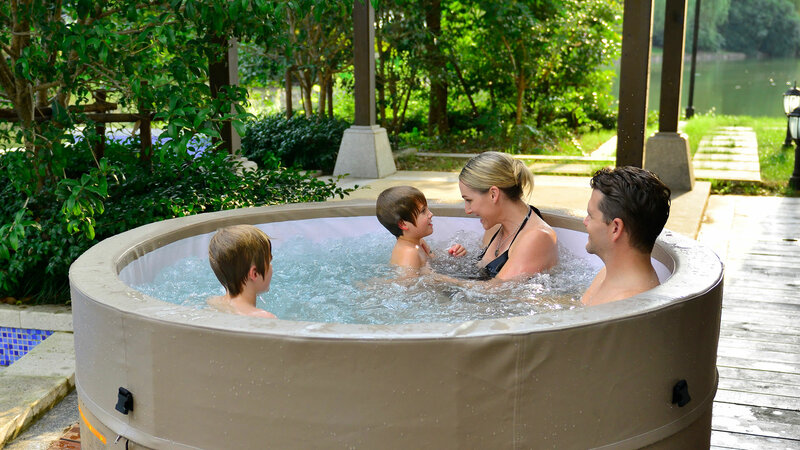 Larger hot tubs that can hold 6-8 people are naturally the most expensive but are great for larger families as well as for those who like to throw parties! Investing in a hot tub can provide you with lots of enjoyment. Water jets and massage systems can relax your body and help alleviate any pains, aches or tension. However, before you choose your first spa, there are some things you need to know. Here are some tips on how to choose the right sized hot tub, the average running costs, how to maintain the unit, and what sort of accessories you can enjoy with it! Hot tubs are usually available in four different depths: 720 mm, 880 mm, 950 mm and 1080 mm, with the deeper models better suited for taller people. When it comes to size, smaller tubs will hold two to four adults while larger units will hold six adults or more. When deciding on the right size for you, consider the following. Are you planning to invite friends and family to your hot tub? Are you going to be organising parties? Is your hot tub just for your personal use? Once you’ve paid for installation and the cost of the spa, expect to pay for electricity and water costs. These will vary depending on its size and how many water jets you have. As a general rule, expect to pay up to £25 per month on electricity and £12 per month for water for a larger tub that can hold about six adults. Energy efficient hot tubs might cost you less money although if you are taking out insurance for the item, you should factor this into your budget too. You will need to maintain the hot tub throughout the year to keep it operating properly. This is usually straightforward. Check for signs of wear and tear, especially during periods when you don’t use the item, and make sure you clean the hot tub on a regular basis to reduce dust, grime and dirt build-up. Investing in a hot tub cover and enclosure might prove to be beneficial. Enclosures protect the tub from adverse weather and the elements. When purchasing a blow up hot tub you should consider all the accessories and supplies you’ll need to buy as well as those you’ll want to buy. For example, filters and chemicals are a necessity for maintaining your spa. Covers and enclosures are also vital for increasing the lifespan of your hot tub. As for those accessories you want, there are numerous to choose from including: sensors, speakers, vacuums, jets, pillows, lights, canopies, steps and lots more! Keeping a cover over your hot tub is a great way to help keep your water clean and clear of dirt and grime. Surrounding your hot tub with an enclosure also helps with this but it’s protection extends to your entire hot tub, keeping it safe from wind, rain and sun. 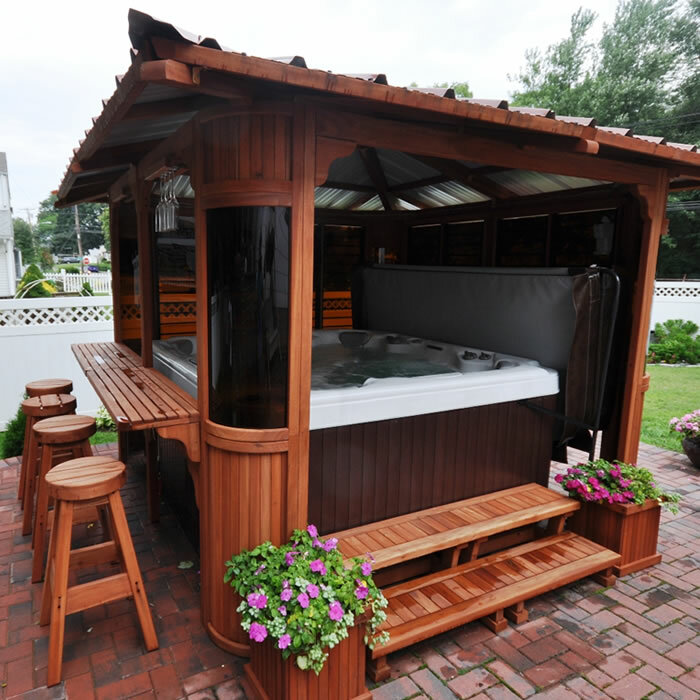 Enclosures are a great way to protect your hot tub from the elements. They come in all sorts of types including gazebos, canopies, even barns. A hot tub cover is a necessity in order to keep the water in your tub as clean as possible. It also provides insulation and protection to the actual tub. 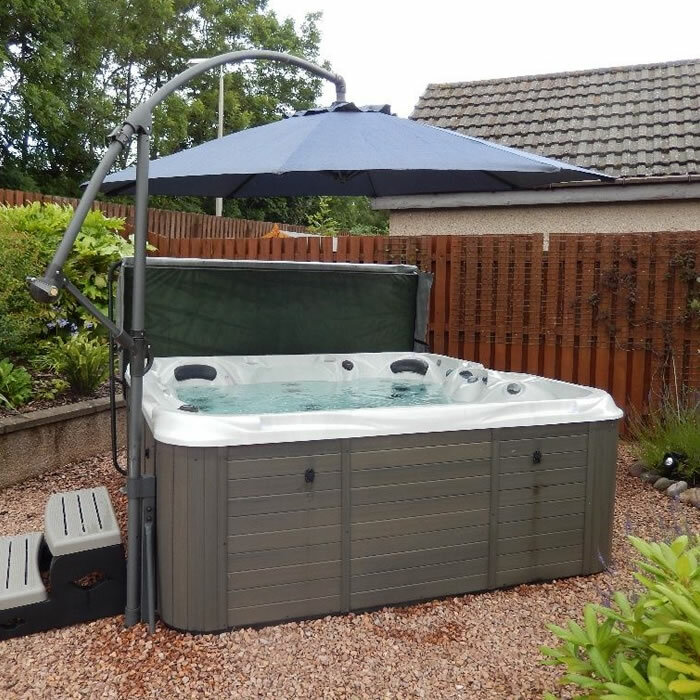 An parasol or an umbrella for your hot tub is a easy to install and relatively cheap way of protecting your hot tub from the cold and wet British weather. Although owning a hot tub seems like plenty of fun and enjoyment (which it is), it also comes along with plenty of work and maintenance to be done as well. So, how do you go about maintaining the hot tub and extending its life? These are some tips for proper maintenance, smooth operation, and keeping repair costs down over its lifetime. Regular testing means testing the spa’s water two to four times weekly and making adjustments as needed. With test strips not only will you know what the pH levels are, but also if there are any contaminants, sediment, dirt, or build up which has to be treated. Proper testing not only maintains the water levels properly, but also the interior body of the hot tub over time. 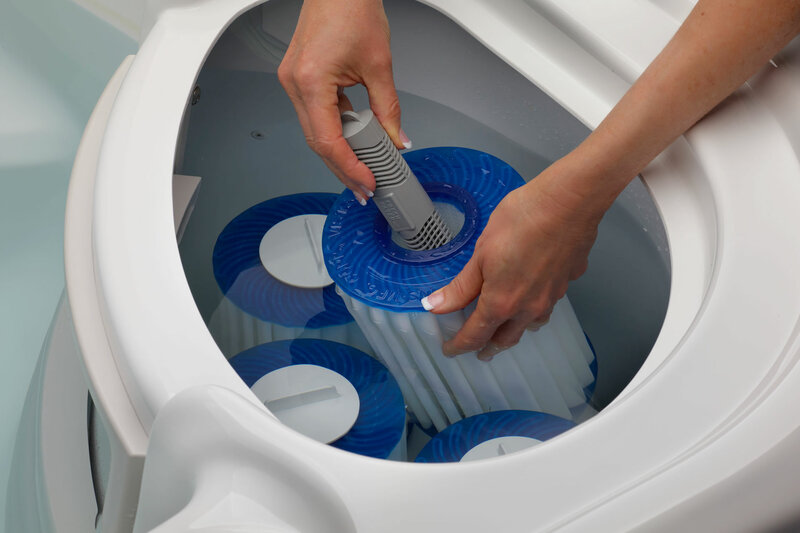 A simple guide to filter cleaning is when you notice the water flow to be affected, it may be time to do something about it.Cleaning the filter a few times annually, anywhere between 4 to 8 weeks time, will extend the filter’s life. Further,you have to keep track of the age of the filter. It should be replaced every 12 to 24 months depending on use of the hot tub, as well as the quality of the filter you are using. Using a spa cleaning solution helps keep out nitrates, phosphates, and other sediment build up. Using a spa vacuum is also a good way to clean the interior of the spa, maintain its appearance, and help reduce the potential of mold or mildew building up over time. A skimmer net is also a good investment to make, which can help get the leaves, dirt, and other visible sediment out from the top of your spa as well. Check out our latest product reviews and how to guides.